Leaders, builders and lovers of social good: get ready! It’s time for our Annual Forum. You asked and we answered. This year we are ‘doing it big.’ We’ve expanded the event to honor our community’s history of generosity and imagine an even greater future of giving. This year’s focus will be Disruptive Philanthropy. We need you as we catapult that dialogue. The day starts with a Design Thinking session to imagine what the future of giving could look like. Here we will fuse creativity and critical thinking to come up with our own ideas about disruptive philanthropy. We need all experiences and generations in the room to make that successful. Following the morning session will be a networking break where the Bush Foundation, our presenting partner, will host a valuable activity to connect us more closely to one another. Lunch will feature a TED-like talk by our keynote speaker, Michael Faye of GiveDirectly. Michael’s organization is an interesting example of what it means to re-imagine anti-poverty initiatives using new technology. GiveDirectly’s creative model re-engineers fieldwork for the digital era, completing cash transfers to the extreme poor in Uganda and Kenya securely, efficiently and transparently, and letting them (the extreme poor) decide where to invest the money. He will speak with us about how his organization came to be, the challenges he encountered, and about how we can take his message and adapt it to our own work. If you’re able to join us for the whole day we will be finishing things off with some giving and entertainment! 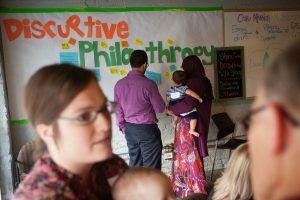 Our Live Giving party will include several small nonprofits with big ideas and the opportunity for the community to instantly support and grow those ideas. Why are we at Charities Review Council so interested in shaking up the status quo? So please, come ready to imagine, create and innovate.